The skin you see today isn’t exactly the same as the skin you’ll see tomorrow. Your largest organ is constantly refreshing itself with new skin cells. Every day, you shed over 30,000 skin cells. Every single day. And they’re replaced with new ones. That’s a lot of cellular turnover. It takes a lot of cells to populate your largest organ. Each square inch of your skin is made up of about 19 million cells. All of them go through an interesting lifespan that’s unique to skin cells. The life story of a skin cell is one of triumph. If it were a movie, it would be about a heroic climb from the depths all the way to the highest heights. But this isn’t an underdog story. The lifespan of your skin cells is the best way for your skin to do its job. A skin cell’s life starts from humble beginnings at the bottom of the epidermis—your topmost of your skin’s three main layers. All your skin cells are born at the junction of the epidermis and the dermis. They all start out full of proteins—keratin and collagen—and shaped like a chubby square. It’s an unassuming start to life for the cells that protect your body from the outside world. But things definitely get better—and harder. Over the next month, these fat, square cells, born at the bottom, will ascend to great heights within the epidermis. 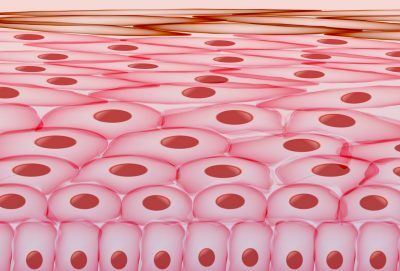 As new cells are born, they facilitate the climb, pushing existing skin cells towards the top layers. That flattens out your skin cells as they’re pushed upward. This is a tough time in the lifespan of skin cells. The arduous journey hardens them and prepares skin cells to do the tough work of shielding the body from the outside world. No skin cell survives the climb. Because that’s what they’re supposed to do—die. All the skin you’re looking at right now is dead. You have to dig down about 20 layers from the outside of your skin to find a living skin cell. They aren’t alive, but that doesn’t mean your skin cells are done working for your health. These flattened, hardened cells create layer upon layer of protection. The top layers of dead skin cells act like the shingles on a roof. They overlap to form a water-tight barrier. That’s how the zombie skin cells keep out the unwanted parts of your environment. Eventually, all skin cells are pushed out by the new cells making the climb. The never-ending procession of cells from below helps dead cells reach the very top layer. At the pinnacle, they flake off. Your noble, triumphant skin cells—the shields that protect you day and night—meet a fairly gross fate. They literally turn into dust. A lot of the dust in your house is actually dead skin. In fact, you produce about eight pounds (3.6 kilograms) of skin-cell dust per year. You’re surrounded by the discarded parts of your skin. So, next time you’re wiping off the counter or dusting your dresser, say thanks. And pay your respects to the tough, triumphant lives lived by your former skin cells. Provide proper sun protection. The sun is a huge threat to your skin. So, you need to practice safe sun exposure. That includes proper sunscreen usage (with frequent reapplication) and the use of hats and clothes to cover up. Eat right. Your diet has a huge impact on your overall health. And there are nutrients and foods you can add to help your skin keep looking young. Focus on a healthy lifestyle. Sleep, exercise, and healthy habits (like avoiding smoking and limiting alcohol) can all benefit your skin. It’s your largest organ, so your behavior has a big impact. Find the right skincare for your skin type. Each skin type requires a different approach. Take the first step and find out what your skin type is so you can properly care for it. Don’t fall victim to common skincare myths. You shouldn’t believe everything you read about skincare. The current skincare revolution creates a lot of misinformation. Investigate whether a hot tip could turn into a tricky situation for your skin. Hydrate. Moisture is your skin’s friend. Dry skin doesn’t look as healthy young as well-hydrated skin does. Hydrate from within—by drinking enough water—and from the outside by using quality skincare that moisturizes.